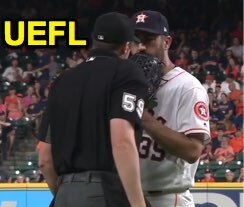 HP Umpire Nic Lentz ejected Astros pitcher Justin Verlander (balk call; QOCY) in the top of the 2nd inning of the Mariners-Astros game. With two out and one on (R2), Verlander attempted to pick off Mariners baserunner R2 Mitch Haniger and, in doing so, was called for a balk by HP Umpire Lentz. Replays indicate Verlander made a motion naturally associated with his pitch and failed to make such delivery while stepping to the side of the rubber, but not toward second base, prior to disengaging the pitcher's plate, and that all callable pitches during the half-inning were properly officiated (12/12 = 100% accuracy), the call was correct. At the time of the ejection, the Mariners were leading, 6-0. The Mariners ultimately won the contest, 8-6. This is Nic Lentz (59)'s second ejection of 2018. Nic Lentz now has 9 points in the UEFL Standings (5 Prev + 2 AAA + 2 Correct Call = 9). Crew Chief Joe West now has 1 point in Crew Division (0 Previous + 1 Correct Call = 1). This is the 115th ejection report of the 2018 MLB regular season. This is the 55th player ejection of 2018. Prior to ejection, Verlander's line was 2.0 IP, 6 ER, 3 HR. This is Houston's 4th ejection of 2018, 2nd in the AL West (TEX 5; HOU 4; LAA, SEA 3; OAK 1). This is Justin Verlander's first ejection since July 5, 2011 (Joe West; QOC = Y-C [Balls/Strikes]). This is Nic Lentz's 2nd ejection of 2018, 1st since July 23 (Kevin Long; QOC = Y [Balls/Strikes]).